National Titles and Podiums for Juventus! 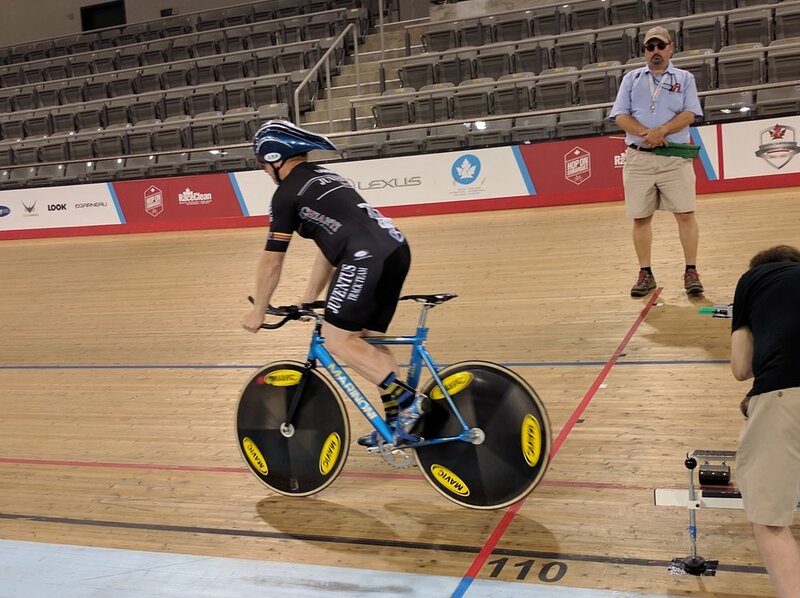 The 2017 Canadian National Elite/Master Track Championships were held this weekend at the Mattamy Velodrome in Milton, Ontario. Juventus was represented in elite women, elite men, master women, and all 3 master men categories. Our results were outstanding with many personal bests, intuitive and smart race tactics, and some truly gutsy performances! Evan Burtnik has been with Juventus since he started in LAMP. He is currently riding for Canada's Team RaceClean. Evan has spent a considerable portion of the past year in Europe, racing and training on the road. Interspersed with road work were a few track projects including one where he raced on a 250 outdoor concrete track in Guatemala City. 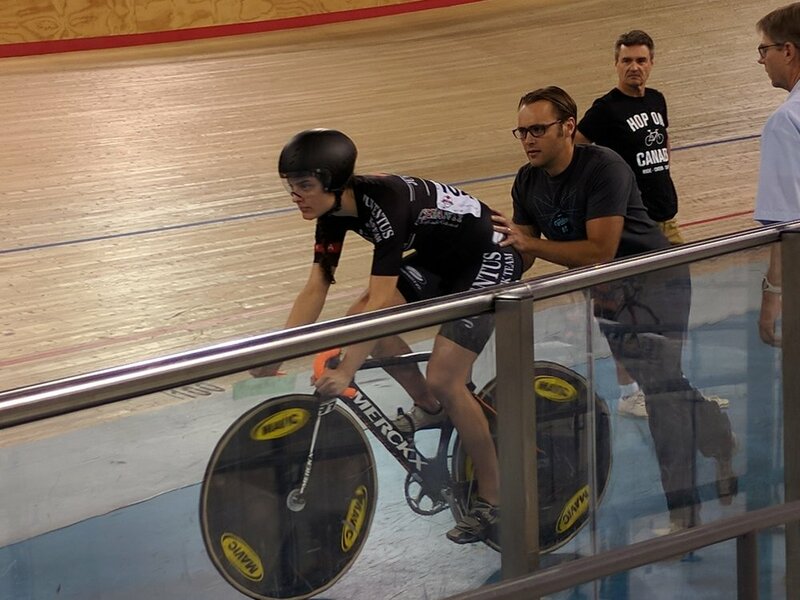 Evan was in beast mode this weekend, and was part of the winning Elite Men's Team Pursuit (TP). Evan also raced in the Omnium, and was one of few who had prior experience with the new format. Once a two day event that included a flying lap and individual pursuit (IP), it is now a one day event comprised entirely of bunch races: a scratch, a tempo (a race that begins with no points for 5 laps and then is point a lap to first across the line every lap until the race is complete . . . and yes you can take a lap for 20 points), an elimination (Devil), and a points race where all the points you earn count toward your Omnium total. 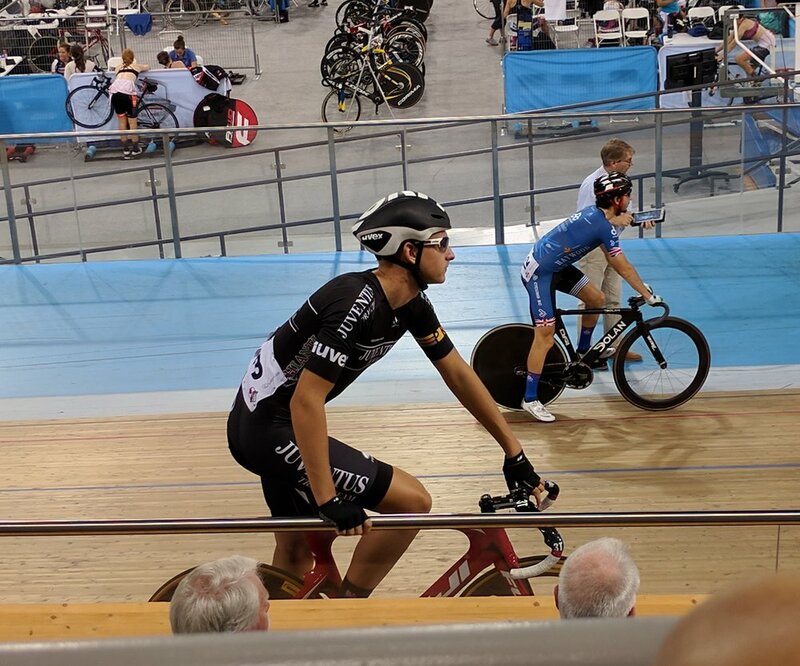 Evan spun his way into the Elite Men's IP Bronze medal final with a 4 second PB, but had to settle for 4th against Adam Roberge. Last up for Evan was the 100 lap Madison race where he partnered with fellow RaceClean teammate and Omnium winner Derek Gee. What a sizzler of a race! Points are available every 10 laps, and timing exchanges to take advantage of fresher legs is critical. Burtnik and Gee both raced aggressively, always looking to take a lap for the additional 20 points. Six very competitive teams made the race spicy from beginning to end, but when it was over, Evan Burtnik and Derek Gee were 2017 National Madison Champions! Kinley Gibson is also a Juventus LAMP graduate and currently races for Ottawa based Cyclery 4iiii. Since track nationals, she has been promoted from Canada's Women's NextGen Program to the Canadian Elite Women's Endurance Program. 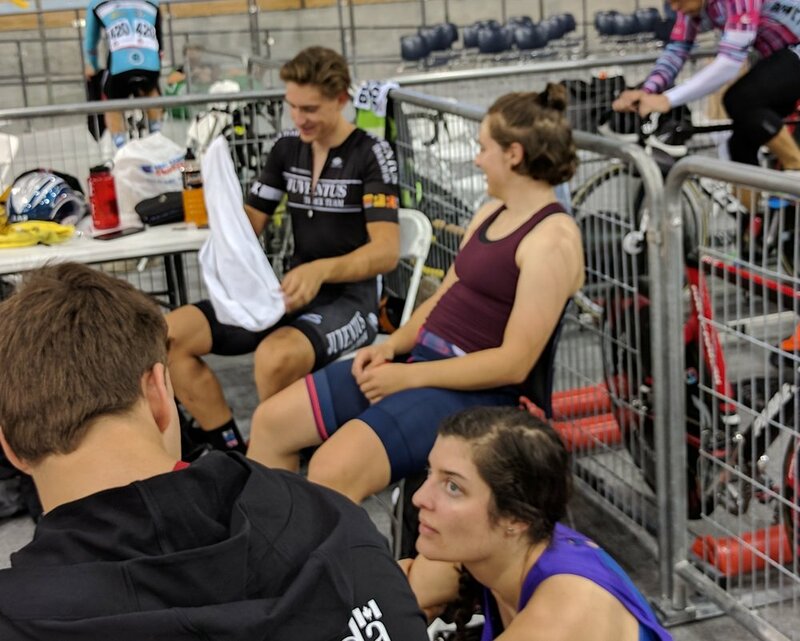 Like Evan, Kinley was busy in Milton - racing Team Pursuit, the Omnium, the IP, and in the inaugural Elite Women's Madison National Championship. The TP at nationals is typically fun; many racers are part of composite teams and riders have little time to practice together. Often an opportunity for much less experienced riders to interact with TP specialists presents itself. It's always interesting to see how the race plan works. Cyclery 4iiii women joined young Quebec talent Laurie Jussaume to take silver - with a very strong ride. 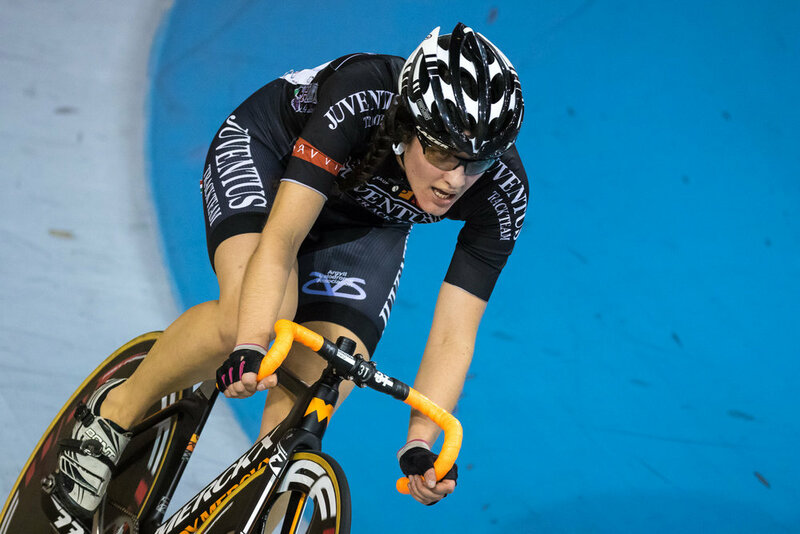 Kinley was the silver medalist in the Omnium in 2016 and was excited for the new format. After completion of the first 3 races she found herself in 2nd place, 2 points off first (tied between Jasmin Duerhring and Ariane Bonhomme). An unfortunate early race crash left Ariane unable to continue, and Jasmin 2 laps (and -40 points) back. Kinley was marked by Allison Beveridge who left Kinley to chase down moves, but could out sprint Kinley for points. A smart competitor, Allison won the championship, Kinley was 2nd, and Annie Foreman-Mackey was 3rd. The next day, Kinley was able to defend her 2016 National Title in the IP. She qualified 1st, by a tenth of second. In the final, she bettered her time by 2 seconds finishing 5 seconds ahead of Laurie Jussaume. 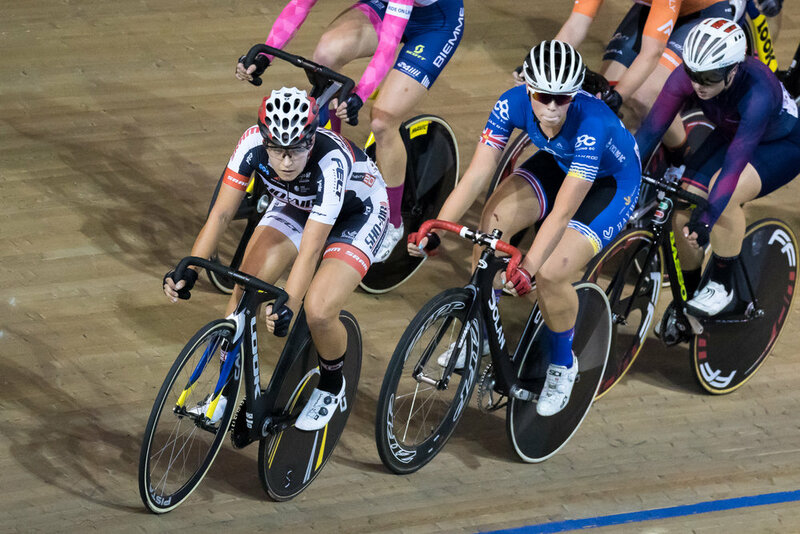 The Women's Madison race almost did not happen. Many did not have experience and were cautious about entering. A afternoon blitz yielded the requisite 4 teams needed, and included a Juventus uniformed composite team of sprinters - Meika Ellis and Ontario's Charlotte Roberge. Kinley joined with Laurie Jussaume, Allison and Jasmin teamed up, and Laura Brown partnered with Annie Foreman-Mackey. It was a really great race to watch, and the more inexperienced riders soon learned better timing of attacks, chase downs, and sprints. The exchanges became more aggressive as the race progressed, and all the riders put on a fantastic show. 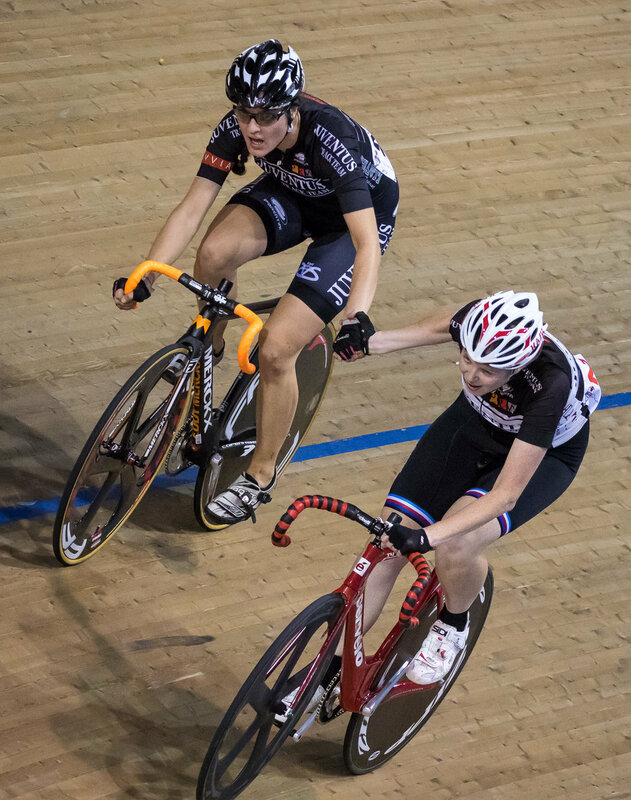 Lindsay Sommerset races in the Master women category and trains with the Argyll Velodrome Racing Academy (AVRA). Lindsay was in Milton to settle a few scores with a track that had removed a bit of her skin the previous year. Lindsay began with her 500 TT. She adhered to coach Alex Ongaro's instructions, and with a strong start smoothed her way to a best time. Next was her nemesis - the Scratch Race. Lindsay eased her way down to the apron for the neutral lap, then steadily worked her way up to the back of the field. She cautiously followed the group, but was able to launch 2 separate attacks during the race - all in all a success! On day 3, Lindsay competed in her final event - the IP. She was focussed, smooth and steady, and raced to a 10 second PB! Eyes covered, Lindsay listened as the last of the women completed their rides. Lindsay became an eruption of tears and shrieks as disbelief was replaced by pure happiness! She was on the podium! Bronze! Peter Hillman competes in Master B men. Pete was our only master sprinter and looked to go sub 12 for the first time. He is convinced that his 11.8 second PB was owed to the club's double disks. Perhaps there was also some good training and preparation? - probably yes. As with the TP, Team Sprint (TS) is often made of composite teams. Pete joined Alberta riders Kevin Rokosh, and Craig Debellefeuille for Bronze in the 6 team showdown. 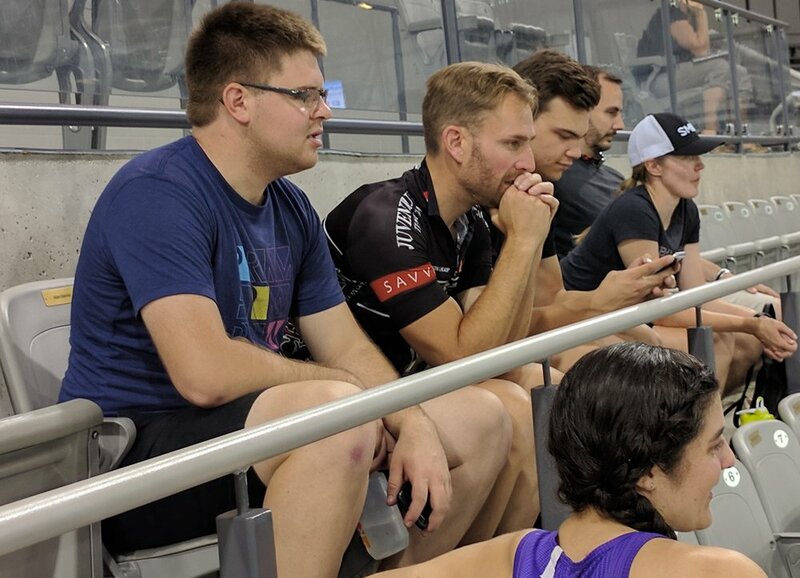 The Keirin allowed Peter an experience no one wants. In the qualifying round, a wheel touch crashed Pete to the boards. Fortunately, only pride and a bit of skin were left behind. A quick check by the medics, and Peter was ready to tell his tale to a concerned extended family, in Milton to cheer Peter on. Devaney Collier is a Juventus member currently training with the Women's Endurance NextGen Program. Devaney opted for non Juventus neutral kit. 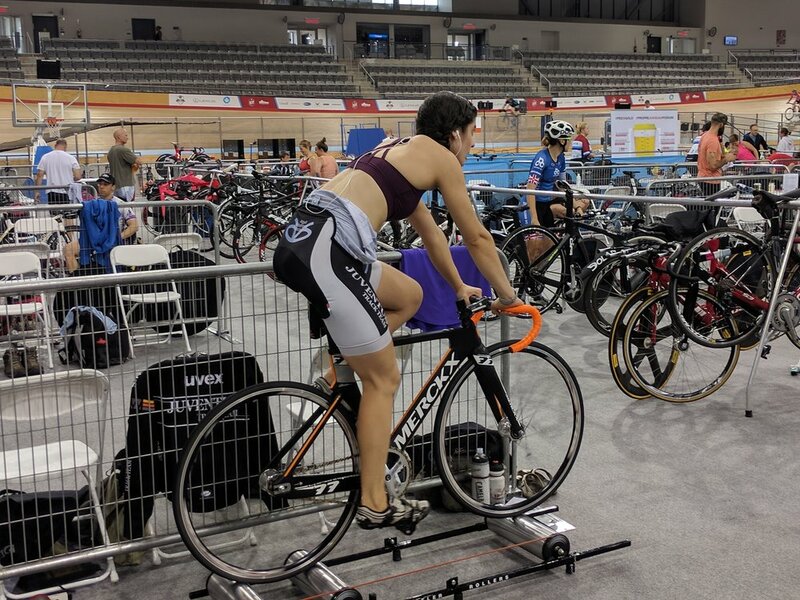 Competing on a composite team for the Team Sprint, Devaney, along with Jenna Nestman, raced to silver in a time of 37.2 seconds. Podium! Next up was the Omnium. Devaney was one of the few racers on the women's side with experience in the new format. Coming into the final points race, Devaney was in 6th position. As the women wound up for the first points on offer, Ariane Bonhomme, adjacent to Devaney, went down - taking out fellow Omnium leader Jasmin Duehring. Although Jasmin was able to rejoin the race, she was 2 laps down. Jasmin was desperate to take laps, trying to dig herself out of the negative. Devaney followed the chase moves and was able to take additional points. She finished the Omnium in 6th place. First up for Dan was the Scratch race. Dan was active throughout, working with the group to chase down 3 off the front. Bad luck reared its ugly head when a commissaire's yellow flag was misinterpreted by the chase group late in the race. The group fractured and was unable to salvage the chase. Dan finished the race in 7th place. Dan was active in his 60 lap Points race, with attacks and counter attacks! Dan also challenged the 3 km IP. Dan's preparation is fastidious, and you know that everything that can be controlled will be controlled. With that, Dan went with mechanic/split caller/holder Adam Todd to the start. Dan looked in good form, and finished with a time equal to his best. Naturally he was aiming to see improvement, and so was not impressed. 18 minutes later, Dan was smiling, thanking everyone for all of their help and hard work, exuding nothing but positivity. Dan is a true competitor. 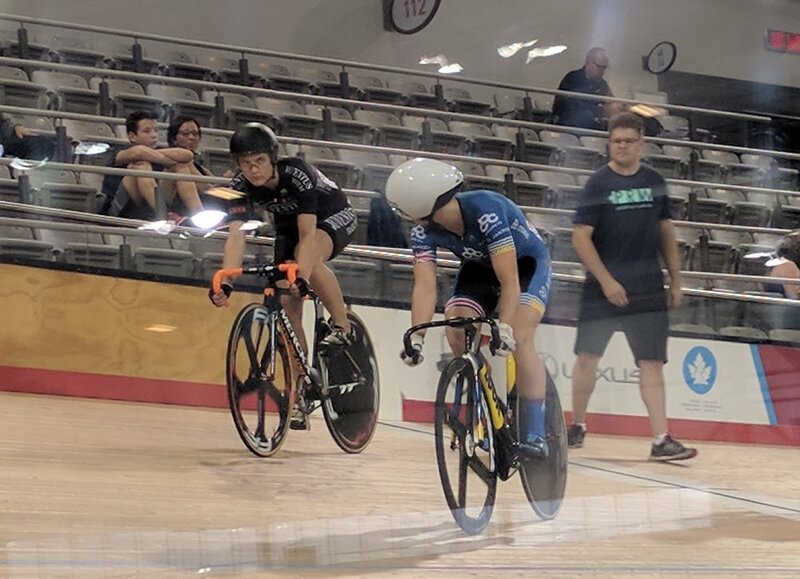 Zac Lipinski is a second year junior and decided to take advantage of the rule change that now allows year 2 juniors to enter elite nationals. A lot of great learning happened this weekend for Zac. He got to experience the fast pace and endurance required at the elite level. He raced the 1 km TT, Omnium, and IP. After some bedazzlement in the Omnium Scratch and Tempo, Zac was ready to really take on the Elimination race. He managed to place himself well in the bunch and kept himself alive until the Devil plucked him off with 8 left of 23 starters. He definitely did well in that one! Next year should be interesting. Meika Ellis is a Juventus club member currently living and working in Ottawa. She competes with the Elite Women. Meika has been busy with work, and most of her prep has been on the road or rollers. This appears to be working quite well . . . after an 8th in the 500 TT, Meika really got things rolling with a 12.6 second 200 TT - a PB! It was enough to qualify for the sprint rounds. Her first match was against national team member Tegan Cochrane. Although Tegan would win both matches, Meika gave her a real run for the money on the first ride! In the Keirin race, Meika suffered a fate similar to Peter Hillman's. A tire touch ended her chances. And that would have been the end of Nationals 2017 for Meika - but the Women's Elite Madison needed more teams . . . Meika used her finagling powers to secure another sprinter (Charlotte Roberge) for a Juventus composite team. She next asked Laura Brown if she would throw with Annie Foreman-Mackey. Along with Kinley, Laurie, Allison, and Jasmin, all raced the first ever Canadian Women's Elite Madison National Championship! There were three teams of enduros, and one team of sprinters. It was clean, safe, fast and amazing! Peter Toth raced in Master C men. 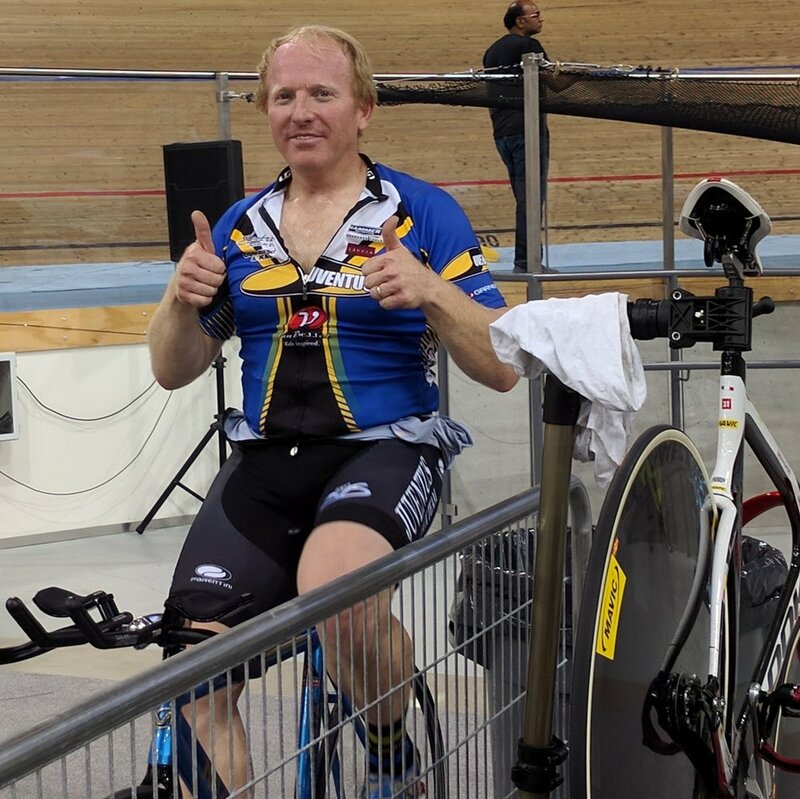 He raced the endurance events on offer, looking to test himself before competition next week at Master World Track Championships in Los Angeles. In the 40 lap Points race, Peter was nipped off the podium, finishing a single point short of bronze. Peter is part of a composite TP that plans to compete in LA. This team was one of 4 in the Master men's TP, and finished with a silver medal. A Scratch race and and IP completed the racing. Juventus always shows so well, especially against the best in the country. Congratulations to all of our competitors!